Pancreatic cancer is a malignant tumor of the pancreas. Pancreatic Cancer may originate from both exocrine glandular component that the endocrine. About 95% of pancreatic cancers are adenocarcinomas. The remaining 5% includes other tumors of the exocrine pancreas, acinar cell cancers and pancreatic neuroendocrine tumors (such as insulinoma). These tumors differ greatly in the process leading to their diagnosis, they require different treatment protocols, and generally have a more favorable prognosis than adenocarcinoma. Adenocarcinoma predominantly affects the head of the pancreas (in 53% of cases), less frequently the body and tail. •	Tail (the leftmost portion of the pancreas that lies adjacent to the spleen). The pancreas is a dual-function gland, having features of both endocrine and exocrine glands. The pancreatic juice is secreted into the small intestine through a system of exocrine ducts in response to the small intestine hormones secretin and cholecystokinin. •	Endocrine pancreas, made up of approximately million cell clusters called islets of Langerhans, secretes hormones (insulin, glucagon, somatostatin and pancreatic polypeptide) into the bloodstream. Epigastric pain, nausea, anorexia, weight loss, loss of appetite (anorexia), bloating, diarrhea or steatorrhea, hyperglycemia which may arrive at the glycosuria. Hyperglycemia may be an early symptom of pancreatic cancer and should not be underestimated. Jaundice occurs when the tumor blocks the common bile duct and this occurs particularly in tumors of the pancreatic head. This lack of specific symptoms explains the high number of people who have a more advanced stage of disease when pancreatic cancer is discovered. •	Diets high in sugary drinks, in particular, the fructose sweetener used in some drinks (as well as the sucrose disaccharide composed of fructose and glucose, which are cleaved by the body) was correlated to cell growth tumor of the pancreas. •	Chronic pancreatitis. [Gut 48 (2): 143-7]. The above disorders have specific genetic abnormalities associated with the noted increased risk of pancreatic cancer. Pancreatic cancer in hereditary pancreatitis is associated with a mutation in the PRSS1 gene. Pancreatic cancer appearing in FAP and HNPCC has been associated with a mutation in the APC gene and MSH2 and MLH1 genes respectively. FAMMM and pancreatic cancer has been associated with a mutation in DKN2A. Endocrine tumors of the pancreas associated with VHL are thought to develop by way of the inactivation of the VHL tumor suppressor gene. Several genomic anomalies have been characterized in pancreatic cancers, which include chromosomal aberrations and mutations. The most frequent chromosomal abnormalities observed in pancreatic adenocarcinomas include loss of chromosomes 18, 10, 4, 15p, 14p, 5, 13p, 21p, and 17p and gain of chromosomes 2, 16, and 1q. - inactivation or loss of expression of various tumor suppressor genes such as CDKN2A/p16,p53, TP53, and SMAD4/DPC4 [Gen eg Dev 2006; 20 (10): 1218.1249], [JOP 2006; 7 (3) :283-294] [Hepatogastroent. 2006, 53 (69): 452-457]. The proteins produced by these genes play a fundamental role in the regulation of proliferation, survival, motility, invasion and cellular differentiation, so as to create a complex network of intracellular signals. A recent paper [BMC Cancer 2008, February 6, 8:43] performed immunohistochemistry on tumor tissue and ductal tissue healthy, showed a complex signal transduction from membrane receptor EGFR / MET receptor through phosphorylation cytoplasmic protein RAS, because the inactivation of tumor suppressor genes such as PTEN and Smad4 and hyperactivation / gene expression of phosphorylated proteins typical of cancer cells such as STAT3, p-ERK . These data show how the complexity and the interrelationship between a number of systems of cellular signal transduction within the carcinoma cells, may explain the limited clinical efficacy of therapeutic strategies based on a single molecular target, such as erlotinib (inhibitor of EGF receptor). Other authors [J Cell Commun Signal 2007; 1:85-90] have shown that in the cells of pancreatic adenocarcinoma there is a quantity of "connective tissue growth factor (CCN2)" 59 times higher compared to normal cells. This protein is a constituent of the extracellular matrix. It is involved in the abnormal growth of connective tissue in response to injury or disease and has properties to modify the signals of cell adhesion and release of cytokine [Mol Cell Biol 2004; 15:5635-5646]. The loss of this protein in embryonic mesenchymal cells causes a decrease in migration / cell adhesion and a reduction of the expression of genes pro-angiogenic and pro-fibrotic. In pancreatic cancer the overexpression of CCN2 correlates with tumor progression is TGF-independent and is caused by activation of the gene promoter by the system ras / MEK / ERK (in fact aberrant, as demonstrated in the previous study). CCN2 is closely related to angiogenesis, progression and migration of tumor cells ductal. The researchers wondered if CCN2 played a role in keeping tumor cells alive in hypoxic conditions. If so, this might explain why CCN2-expressing cancer cells are favored during tumor growth. They found that blocking CCN2 expression in cultured pancreatic cancer cells made them significantly more sensitive to hypoxia-induced death than their peers. Additionally, CCN2 was more highly expressed in pancreatic tumor samples from human patients than in neighboring tissue and CCN2 expression seemed to correlate with the expression of another protein expressed by hypoxic cells. Finally, hypoxic conditions themselves cause the pancreatic cancer cells to make CCN2. Looking ahead, the researchers would like to know whether people with pancreatic cancer could benefit from therapies (for example antibody) targeting CCN2. Infact blocking the expression of the protein slowed or prevented tumor growth in mice and made cultured cancer cells vulnerable to the conditions of low oxygen that occur in solid tumors. More recently studied HMGA1 gene, located on chromosome 6p21, which transcribes the protein HMGA1, which becomes part of a protein complex called "enansosoma", with the action trascrittivi gene promoter to bind to and regulate the bending of the helix DNA [Cell 1995; 83:1091-1100]. Overexpression of HMGA1 has been associated with metastasis of pancreatic carcinoma cell invasion by increasing due to the system P13K/Akt kinase that modulates the activity of metalloproeinasi-9 (MMP-9) [Cancer Res 2006; 66 (24) .11613-11622]. The selective suppression of this protein inhibits the in vitro invasiveness and metastasis in vivo. Another interesting action of the molecule is the ability to regulate transcription of the insulin receptor always through the activation of the system P13K/Akt. This, not coincidentally, is also directly activated by the signaling pathway Ras / ERK. A subsequent study [Br J Cancer 2008, 98 (8) -1389-1397] showed that in 93% of patients resected for ductal adenocarcinoma is an overexpression of HMGA1 in tumor tissue. The subjects have a significant adverse increase in survival compared to those with higher tissue levels of HMGA1. The protein overexpression results in a net increase of the proliferation of cancer cells in the absence of anchoring. The selective blockade in vivo HMGA1 reduces the cell proliferative index (Ki-67 index) and increases apoptosis, even in the presence of mitogenic signals arising from ERK. The increased expression of metalloproteinase-9 controlled by the protein Gli1 (included in the signaling pathways of growth Hedgehog) involves the increase of the capacity for invasion of pancreatic cancer cells [Cancer Sci 2008; 99 (7) :1377-1384]. Aberrant hypermethylation of promoters is commonly observed in cancers and is one of the contributing factors for inactivation of tumor suppressor genes. Several genes important in the pathogenesis of pancreatic cancer such as p16/CDKN1A , APC, TSLC/IGSF4, SOCS-1, cyclin D2, RASSF1A, WWOX, RUNX3, CDH13, DUSP6, HHIP and SLC5A8 undergo aberrant methylation, leading to reduced expression or loss of expression. The aberrant methylation was found to increase progressively with the advancing stage of pancreatic cancer. MicroRNAs (miRNAs) are RNA molecules 18 to 24 bases long that regulate the stability and translational efficiency of the complementary target mRNAs. The role of miRNAs in development and disease has become evident during the past few years. Has been identified a global expression pattern of miRNAs that can differentiate normal pancreas, chronic pancreatitis, and pancreatic ductal adenocarcinoma. 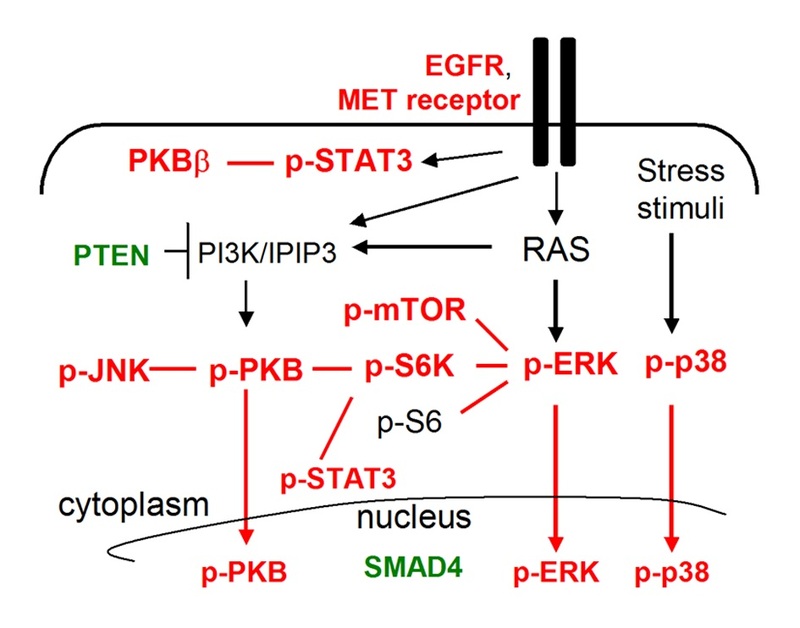 Two pathways thought to be relevant in the biology of pancreatic tumors: the epidermal growth factor receptor (EGFR) and vascular endothelial growth factor (VEGF) pathways. The EGFR, via a cascade of downstream signaling events triggered by its activation, mediates cellular processes such as cell division and survival; overexpression has been shown to occur in several epithelial tumors and to correlate with worse outcome. The VEGF on the other hand is a key regulator of angiogenesis, believed to be a necessary requirement for the progression and spread of cancer cells beyond a small focus of malignant but otherwise isolated cells. Pancreatic cancer is usually discovered during the evaluation of the previously mentioned symptoms. The liver function tests may show a combination of results indicative of biliary obstruction (increased bilirubin, increased levels of γ-glutamyl transpeptidase and alkaline phosphatase). Among the imaging studies the gold standard for detecting the disease is the spiral CT of the abdomen. Ultrasonography is useful in the diagnosis instead of the first level or to detect liver metastases. ERCP and EUS (which can also do needle aspiration) are useful to show the involvement of the biliary and pancreatic stent in the palliative treatment with the second. The tumor marker CA 19-9 (carbohydrate antigen 19.9) is a sign very sensitive (even if not specifically) which is prevalent at very high levels in patients with pancreatic. It is normally used to monitor the evolution of the disease. Emerging evidence has suggested that the capability of a tumor to grow and propagate is dependent on a small subset of cells within a tumor, termed cancer stem cells. Using a xenograft model in which primary human pancreatic adenocarcinomas were grown in immunocompromised mice, Li et al. identified a highly tumorigenic subpopulation of pancreatic cancer cells expressing the cell surface markers CD44, CD24, and epithelial-specific antigen (ESA). Pancreatic cancer cells with the CD44CD24ESA phenotype (0.2-0.8% of pancreatic cancer cells) had a 100-fold increased tumorigenic potential compared with nontumorigenic cancer cells. These cells showed the stem cell properties of self-renewal, the ability to produce differentiated progeny, and increased expression of the developmental signaling molecule sonic hedgehog. Identification of pancreatic cancer stem cells and further elucidation of the signaling pathways that regulate their growth and survival may provide novel therapeutic approaches to treat pancreatic cancer, which is notoriously resistant to standard chemotherapy and radiation. Changes in oligosaccharide structures have been reported in certain types of malignant transformation and thus can be used as tumor markers in certain types of cancer. In the case of pancreatic cancer cell lines, a variety of fucosylated proteins are secreted into the conditioned media. In pancreatic cancer was found that the β chain of haptoglobin, a protein that binds free hemoglobin released from erythrocytes to inhibit its oxidative activity, is highly fucosylated . While the appearance of fucosylated haptoglobin has been reported in other diseases such as hepatocellular carcinoma, liver cirrhosis, gastric cancer, and colorectal cancer, the incidence was significantly higher in the case of pancreatic cancer . Fucosylated haptoglobin was observed more frequently at the advanced stage of pancreatic cancer and disappeared after operation. Haptoglobin showed that the α 1-3/ α 1-4/ α 1-6 fucosylation was increased in pancreatic cancer, compared to in normal volunteers and chronic pancreatitis. Therefore, increases in fucosylation seem to be not due to inflamation, but cancer itself. Data suggest that pancreatic cancer produces a factor that induces the production of fucosylated haptoglobin. Thus, fucosylated haptoglobin could become a novel tumor marker for PC. Currently available markers such as carbohydrate antigen (CA) 19-9 lack the desired sensitivity and specificity because they are also overexpressed in inflammatory conditions such as chronic pancreatitis. Although a TNM staging system exists for pancreatic cancer, most clinicians stage the disease in reference to its treatment implications: local/resectable, locally advanced/unresectable, and metastatic. Some recent advances in surgical oncology have made possible surgical resection even in tumors that once unresectable because of involvement and infiltration of large vessels like the aorta, the vena cava or the celiac trunk. Palliative surgery has as its objectives to reduce jaundice, duodenal obstruction and pain. To do this relies on the creation of anastomosis, and drainage for biliary stent. [Ann Oncol. 2008, 19: 1224-30]. The chemoterapic agents used for advanced pancreatic cancers are 5-fluorouracil (pyrimidine analog) and gemcitabine (deoxycitidine analogue). Gemcitabine is more effective than 5-FU but its efficacy as single agent however is modest. So, in order to improve its efficacy, it is tested in combination with other drugs. Gemcitabine is a deoxycytidine analogue. It exhibits cell phase specificity, primarily killing cells undergoing DNA synthesis (S-phase) and also blocking the progression of cells through the G1/Sphase boundary. Gemcitabine is a pro-drug and is metabolised intracellularly by deoxycytidine kinase into the active diphosphate (dFdCDP) and triphosphate (dFdCTP) nucleosides. The cytotoxic effects of gemcitabine are exerted through dFdCDP-assisted incorporation of dFdCTP into DNA, resulting in inhibition of DNA synthesis and induction of apoptosis. The preliminary results suggest that combination chemotherapy may be better than gemcitabine alone for the treatment of advanced pancreatic cancer. Capecitabine, an orally administered precursor of 5-FU, is well absorbed in the gastrointestinal tract and preferentially converted by thymidine phosphorylase in tumor cells to the active metabolite. In the GEMCAP trial, the gemcitabine–capecitabine combination resulted in a median OS of 7.4 months, compared with 6.0 months for gemcitabine alone [hazard ratio 0.80, 95% confidence interval (CI) 0.65–0.98; P = 0.026], and an absolute improvement in 1-year survival of 7% (26% versus 19%) (Table 1). The GEMCAP regimen proved to be very well tolerated. Although a modest improvement, similar results were not seen in a second trial of a similar combination. That study reported at the same time only demonstrated a trend towards a benefit in favor of the gemcitabine–capecitabine regimen over gemcitabine alone which was not statistically significant, possibly due to the study being underpowered. Erlotinib is a tyrosine kinase inhibitor. In the NCIC CTG PA.3 trial gemcitabine is used in combination with erlotinib that blocks the EGFR pathway. This combination has been shown to improve survival compared with gemcitabine alone. The median OS in the erlotinib-containing arms was 6.24 months compared with 5.91 months in those patients who received gemcitabine plus placebo, quite a small difference in the medians although the overall reduction in risk of death (hazard ratio 0.82, 95% CI 0.69–0.99, P = 0.038) and improvement in the 1-year survival with combination treatment was more notable (23% versus 17%, P = 0.023) (Table 1). This survival benefit comes at the cost of a slight increase in the incidence of grades 3 and 4 skin rash (6% versus 1%) and diarrhea (6% versus 2%). Unfortunately, targeting VEGF has also not been successful, despite initial promise. Other biological agents which have been evaluated in pancreatic cancer with negative results include the farnesyl transferase inhibitor tipifarnib and the matrix metalloproteinase inhibitors, marimastat and BAY 12-9566. •Iodice S, Gandini S, Maisonneuve P, Lowenfels AB (luglio 2008). Tobacco and the risk of pancreatic cancer: a review and meta-analysis. Langenbeck's Archives of Surgery 393 (4): 535–45. •Chang JM, Wang F, Holly EA (settembre 2005). Vegetable and fruit intake and pancreatic cancer in a population-based case-control study in the San Francisco bay area. Cancer Epidemiology, Biomarkers & Prevention 14 (9): 2093–7. •Efthimiou E, Crnogorac-Jurcevic T, Lemoine NR, Brentnall TA (febbraio 2001). Inherited predisposition to pancreatic cancer. Gut 48 (2): 143–7.